The Bank of Canada (BoC) made its regularly scheduled interest rate announcement this morning, and is choosing to hold the target for the overnight rate at 0.50%. The rate hasn’t changed since July 2015 and isn’t expected to move until sometime in 2018. While this recovery takes place, the Canadian housing market is one piece of the economy keeping things afloat. It also happens to be one that’s most affected by changes to the overnight rate. 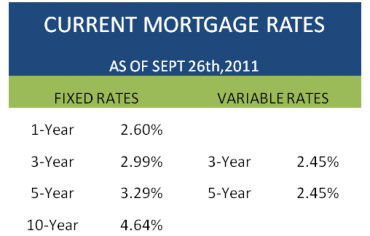 Variable mortgage rates are directly tied to the key interest rate via the prime rate set by the major banks. Fixed mortgage rates aren’t directly tied to the key rate but mortgage qualifications are based in part on whether consumers can afford to service their other debts, something that’s more likely when rates are low. Moving rates in either direction could spur or stun the housing market, and in turn upset the overall economy. That’s a risk the bank doesn’t want to take. The BoC makes this announcement two days before Statistics Canada announces August’s unemployment numbers (interest rate announcements follow a fixed schedule that’s set well in advance). Reporters had used this argument to predict today’s non-change, but the BoC announcement makes it clear where unemployment falls in the list of priorities. “While a healthy labour market and solid consumption should remain supportive of growth in the rest of the year, the outlook for business investment has become less certain,” it says. Most economists are predicting the BoC will continue to hold the key interest rate steady until the first quarter of 2018. But in the past the BoC has claimed to be solely focused on inflation. So regardless of what’s happening with consumer spending habits and the economy at large, changes could still be made based on that mandate. The Bank of Canada will have its next opportunity to make such a change with the next interest rate announcement, scheduled for Wed., Oct. 19. How Could Negative Interest Rates Affect Mortgage Rates?